Not since the end of 2011 have there been this many updates in the European Beer Challenge in this sort of time frame. Believe your eyes people, this is new country #3 in the space of a fortnight. 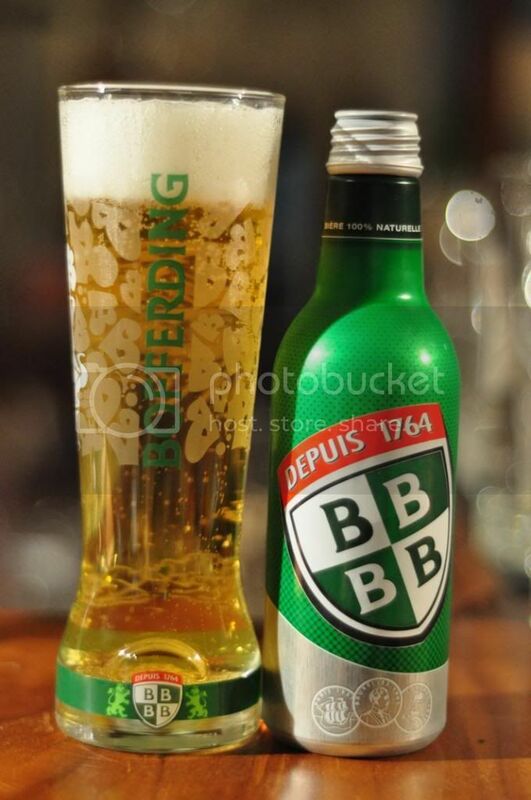 Bofferding comes to us straight from the source, so thank you to those involved that helped make this happen. I initially thought that Luxembourg would be a hard country to get my hands on, purely because it's tiny! With a population of around half a million people, there isn't a great deal of need to produce vast amounts of beer, especially when you are bordered by both Belgium and Germany who both make more beer than your country could possibly ever need! With all this in mind I go into this review with relatively low expectations. So I tried this in my hotel in Paris before heading out for Lizzie's birthday lunch, if my second one makes it home safely hopefully we improve on the photo. Anyway the beer poured very well with a golden liquid with plenty of carbonation topped by a brilliant white head. The head was 3 or 4 fingers tall and had good retention and excellent lacing. A very impressive start from Bofferding. I thought this would definitely be a beer to bring out the lager rule on, but I was pleasantly surprised by this one. There's actually an aroma here! It is a faint one but it is certainly appealing. There is some very light grains initially which are complimented nicely by some grassy hops, which provide contrasting bitterness. Hopefully Luxembourg's beer can bring it home with a good taste! Bofferding really surprised me! It's a lovely, well made lager. It has clean relatively light malts up front which are quickly replaced by surprisingly bitter hops. The hops have a grassy quality to them (Saaz?) and leave the mouth feeling quite oily. Despite this mouthfeel it's very light and has alot of tiny bubbles that help to cleanse the palate and leave you wanting more. Well done Luxembourg! As macro lagers go this is a very very good example! This beer would appeal to the masses and the slightly more discerning drinker as it has that little bit more complexity than many other macro lagers, with the hops being a standout for me. Was this due to the freshness? I imagine it had something to do with it and I wouldn't be surprised if the aluminium bottle also had something to do with keeping the beer so fresh. I'd certainly recommend you trying this beer if you come across it!